Eleni had Nilla wafers and milk this morning and it made me wish I was little. In her typical kind manner she politely offered me a few from the pile on her paper towel. After responding with a smile and a nothankyou, I realized how far I am from being little. I was content with my coffee. Once Jeff joined us at the breakfast counter content with his coffee, Eleni began describing why she likes Nilla wafers so much, and it has something to do with how chewy they are. "Oh, I think of them as crunchy," I replied. "No! They are chewy," Jeff confirmed. "Don't you remember that? That's what I've always loved about them." he added and then "when was the last time you had one?" "I dunno, maybe a few years ago," though I couldn't say for sure. In maybe not so unrelated news, I cannot stop dreaming about scribbling around with my new colored pencils the moment that other priorities are swept aside. I can already see the little forms in my head that I want to play out which have been developing from one day to the next, and its time to get them on paper before they float off. The images are happy and charming and I don't want them to go anywhere until we've had a chance to talk. 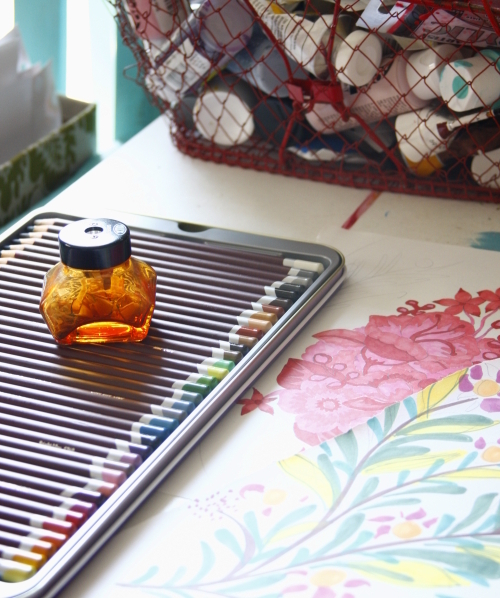 I've had the new pencils (and cute new inkwell sharpener) on my work table in the studio for precisely 4.5 days. I am growing very impatient to release some of their smooth hue onto a clean white board. I messed around with markers plenty this summer, preparing thoughts for new designs, and I'm ready for pencils now. This will be the indulgence waiting for me today, whatever age that makes me. Do tell. What kind of pencils did you get? I don't recognize them. And...I've never thought about it before, but nilla wafers are chewy. A brilliant observation. Thank you, thank you, thank you! You make sewing so much fun for us all. I think of Nilla wafers as crunchy as well. They are A MAZ ING with Nutella spread on them. MMMMM! What a lovely reminder to savor these little moments in our everyday lives...and the nilla wafers! Lovely artwork under your pencils. Enjoy creating today. I don't like nilla wafers precisely because I don't like how they get chewy fast! I just received several of your beautiful Garden Party fabrics that I ordered on-line. Just amazingly beautiful! I had several fabrics from another designers line and they were so boring, so I was happy to be able to inject these 5 fabrics... Hopefully I will remember to add a pic of the completed quilt top to the flickr group, but in the mean time I am posting all the fabrics together on my blog later today. I love cookies and coloring as well. I had to go get a nilla wafer out of the cupboard and try it for myself to see about the 'chewy'...mmmmm....now I remember why I like them! Thanks for all the inspiration and beautiful pictures. I love your work! Yes, Nilla wafers are good, but I could really go for a Lorna Doone - haven't had one of those in years either! That's Marsha from CuteStuffInside.blogspot.com in case you're wondering. Looks beautiful and sooo fun! I need to spend some time creating some more artwork too! Love your fabrics, keep them coming! All the talk about Nilla wafers made me crave banana pudding. It's bben years since I made some. Looks like you've already done some interesting doodling there. Can't wait to see what your next big thing is. I am loving your paintings and I know what you mean... I've had some new inks just waiting to be used for the first time! I should be sewing... but that's when the urge to draw comes!!! OH! COLOURSOFTS! You'll LOVE them - have fun!! They're not as stroppy as prismacolors. And yay for coloured pencils. People are always saying to me "Err - why don't you just use paint...?" and I am forever having to say that I just love coloured pencils. So I get very happy when I see someone else happy to use the ol' pencil - can you tell?? I don't know if you have a Trader Joes there but they have the best "Ultimate Vanilla Wafers". They are not chewy but are so vanilla-y and yummy. I do love regular old vanilla wafers too though. Vanilla anything really. 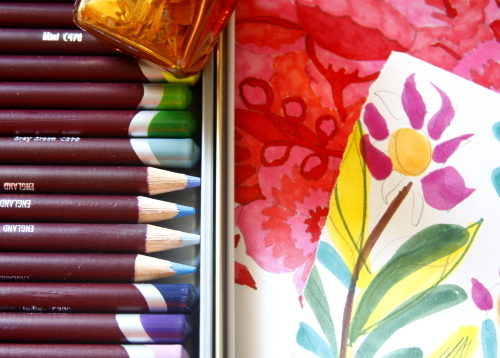 And now you've got me coveting colored pencils! I have a 20 month old and I don't get to paint as much as I used to, so I need an artistic outlet that can easily be put away and out of reach. Those might do the trick! Are the sketches from the colored pencils or the markers (I have design markers too, but the fumes are pretty bad)? And what type of paper do you like to use with them? your work is so very inspiring!!!! I love your photos on your blog too!! I would say that makes you the perfect age:) Enough years to make you wise and enough youth to make you creative and colorful at heart. Have fun coloring! coming to introduce myself, I'm Kim and say " :) ". p.s. You're children have so beautiful names! Have a great day with your new pencils! Your drawings look very sunny in these autumn days. Nillas are chewy. My boys can attest to that. Love the doodles. Vibrant i'd say. As always, Can't wait to see what comes of these drawings! Your pictures make me want to draw today. The child in me can't resist the sight of coloured pencils. I love that you enjoy the coloring part of work. I do too! I often pick my kids up at school and say "I got to spend two hours coloring today!" As a civil stormwater engineer, I get to use highlighters, colored pencils and markers to outline drainage areas, storm systems and ponds. I get to crawl around on the floor like a toddler, coloring on my maps. It makes me so happy! I don't know Nilla wafers but after reading your description I am, for some reason... craving one :) - I love what you are making with your desirable pencils, is it a new exciting fabric line you're working on? This is my first time to comment. I love your blog and have been reading it for some time now. Your pictures are exceptional and I love you work & style of writing. Again - love your work & thanks for the inspiration! Hello- did you use those pencils for the artwork in the pictures? It looks like watercolor or maybe watercolor pencil- maybe even marker? If those colored pencils are that vibrant I definitely need some! Are they plain colored pencils or water color pencils? Either way - how DO you get that painterly feel with them? The red flower is just GORGEOUS and I never could figure a good technique for operating either colored pencils or watercolor pencils. Do share your technique, pretty please?! I had to come back and comment because I found a new candy corn! Have you tried the carmel ones????? Oh my, I am in heaven and might need major dental work by the end of the season. They were on the shelf right by the regular candy corn...but they are carmel. Eeek! So much goodness. What a bright and lovely Monday Morning Post! Just cheered me up considerably! Your designs are so beautiful, I can't wait to get my hands on some of your new fabric! Gorgeous, gorgeous. I'm googling those pencil crayons as soon as I'm done commenting. Nilla cookies are crunchy to me. They make a great base for a cheesecake! !